Lying in bed under the weather I decide to finish the Kenshin live action films. The second and third films- telling the Kyoto arc from the Manga and Anime were released in Japan in August and September of 2014. I had picked up DVD copies of the films as they were released overseas but held off watching them - because I was sure I was going to get the chance to see them on the big screen at one of the film festivals over the last year- amazingly that never happened. Before I start I need to make one thing completely clear this film and the next, THE LEGEND ENDS are really one film split in half. The place that the story stops in this film is a logical one, however it’s more a chapter break so you will not have a conclusion to anything when this film ends. Additionally you'll have no idea what is going on in LEGEND ENDS if you don't watch this. And while I'm at it if you don't watch the previous film you will be very lost as to characters. This story is a condensed version of I believe the second story arc in the comic and anime series. Not that it makes a difference, so long as you've seen the first film you'll be okay. Truly epic film is both a film for the heart, thanks to a compelling plot and frequent bursts of action, but also a film for the head thanks the large number of thematic elements running through it. Who ever thought that action epics had to be stupid never saw the films in this series. I'm blown away by how much material they crammed into this film. There is so much going on and there are so many characters I completely understand why so many of the characters retain the look of their manga and anime counterpart- if they didn't we couldn't tell them apart. The film nicely balances action with story to the extent that we never lose track of the characters and what they doing. If some of the bad guys are not as well drawn as the heroes its only because they didn’t have an earlier film to set them up. To its credit this film (and the next) have some great thematic threads running through it. Notions of our ties to the past, how is best to govern and what is the best for society are inserted in the film in such a way that you don’t realize that the film is raising so many ideas. I’m certain that most people are going to get to the end and never realize that the film is having a debate with you. What I love is that Kenshin’s character arcs. 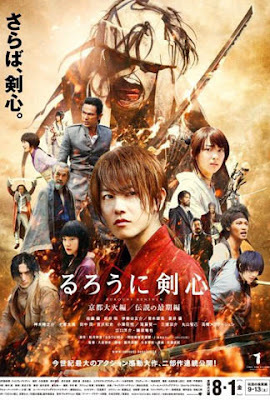 There is is a real character change over the course of the film Shishio and his men really do break Kenshin and when he considers breaking his vow not to kill we completely understand he really has no choice. It’s a wickedly cool moment that the filmmakers let him do that far. The action is first rate. I want to pick one set piece out to discuss it but which one? They are all good.